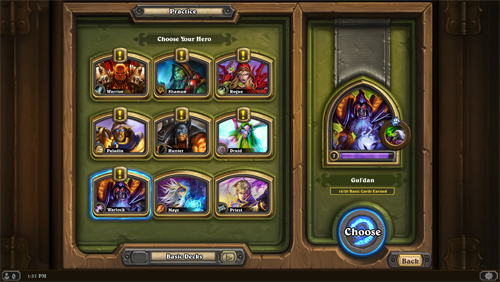 So the Hearthstone Beta started yesterday. I talked a little about what happened on the Hearthstone Players web site. But I think I’ll chronicle the progression of my heroes here on this blog. I started out as Jaina and worked my way through the tutorial. It starts out easy and gets progressively more difficult. At the end I was on the edge of my seat wondering if I’d finish it or not. But I did. As long as you’re paying attention to what’s going on, you wont have any problems. Once you’ve cleared the tutorial you can jump into the Practice Mode (aka Normal AI) and level your hero. There are 9 of them and at the beginning the only one you can play is Jaina. To unlock the other heroes you have to defeat them on normal AI. I was (and still am) excited about the Priest deck so that was the first one that I unlocked. And I played the priest for a long time, trying to unlock the others. I was able to level him up to level 11. But defeating some of those heroes with a basic priest deck is really difficult. So I switched to Warlock and was able to finish up unlocking all of the heroes. Once you’ve unlocked all of them you get access to the Expert AI and the Arena. Which I saved for today. By the end of the night I’d leveled Anduin and Jaina to 11 and Gul’dan to 7. That’s where I called it a night. Today I tried the Arena. Which was probably a bad idea. I was familiar with the 3 classes that I’d leveled a bit so I figured at least one of the Hero Picks they gave me would be a familiar one. What I forgot was that with a 33% chance of getting a familiar class there is a 66% chance that you wont get one of those. The rest of today has been spent leveling Anduin to level 18 through the Normal Play mode. That is playing against other people. 1) When switching from Mage to Priest remember that your hero power now heals instead of doing damage. I don’t know how many times I accidentally healed the enemy when I meant to kill it. 2) At the bottom of the deck selection page there is a little arrow controller that switches between your constructed decks and the basic decks that are provided. The default setting is basic decks you have to switch it to play with your constructed deck. I made it all the way to level 14 before I realized this. Total noob mistake! 3) Don’t feel bad if you start out and are getting defeated a lot. That’s normal until you’ve had some time to build up your deck and learn how the different cards synergize. You’ll get it. It’ll just take time. Good Luck! This game is a blast! « Hey! Where’d I Go?